And you thought tornadoes and hurricanes were bad? Around 7:00 pm on Tuesday March 6, 2012 a powerful solar storm on the surface of our sun, unleashed the largest solar flare recorded this year. Much like earthquakes, hurricanes and your Facebook comments, solar flares are measured on a rating scale. Based on the scale for solar flares which runs from A, B, C, M and X. An A solar flare is the weakest and of course, an X would be the strongest. Tuesday’s flare rated an X 5.4 class flare. Both NASA’s Stereo-B spacecraft and its Solar Dynamics Observatory observed the coronal mass ejections which erupted from the solar flares. One of the two also captured the images seen in this post. Neat huh? Much like the storm that created the Fantastic Four, this X-class (not to be confused with the X-Men) flare could disrupt satellite communications, power grids and produce exciting auroras at both poles. 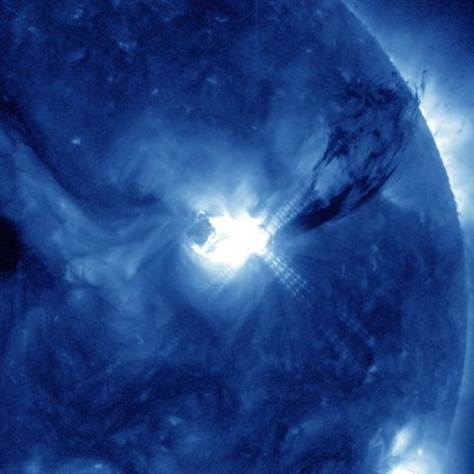 Solar flares occur all the time however they are not always ejected towards the Earth. Presently the sun is in a very active period which happens every eleven years or so. 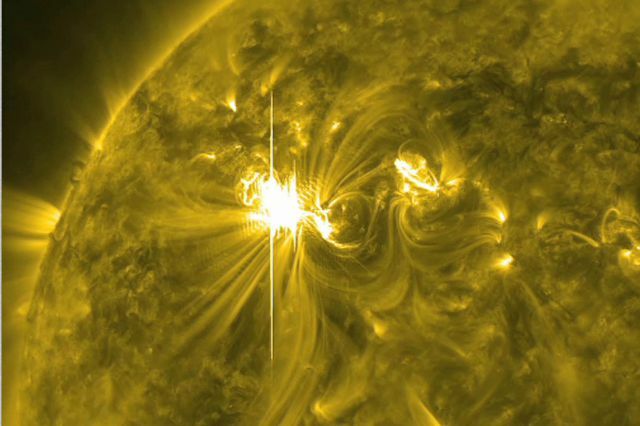 The flares could cause a geomagnetic storm on Earth. Wikipedia states, in language I am too ignorant to fully understand; A geomagnetic storm is a temporary disturbance of the Earth’s magnetosphere caused by a disturbance in the interplanetary medium. A geomagnetic storm is a major component of space weather and provides the input for many other components of space weather. A geomagnetic storm is caused by a solar wind shock wave and/or cloud of magnetic field which interacts with the Earth’s magnetic field. This entry was posted on March 8, 2012, 10:25 AM and is filed under Astronomy, The Sun, Weather. You can follow any responses to this entry through RSS 2.0. You can leave a response, or trackback from your own site. Thanks for this. I knew about the effects in advance, but I didn’t know about the ratings. Supposedly (unnamed pundits say) the future flares get more intense, but how does that happen if this one was X, the top of the chart? Fay, it’s good to see you here! I think my comment on your blog went right to spam. I think like hurricanes are getting stronger and they might have to change the scale, perhaps the same thing might need to happen with solar flares. We’ve only been tracking them for just a few years in the grand scheme of things so we really don’t know the Sun’s power. Human scales don’t mean a thing. Nature does what it wants. i should stay outside, I might get superpowers from it. One can only hope so. If you get them let me know what powers you get. You are correct Stacie but this guy has it right. I understood most of it. PM, it just means NASA gets it’s name in the news. This is way cool but I don’t think I will lose any sleep over it! No, and you need your sleep to get well. Great stuff! What would you do without a mobile? I think I’d last about 3h on my laptop’s battery and watch a movie or something. I think I saw on Discovery channel or something that if a large flare did hit, as long as the power companies shut off the grids before the storm hit, they should function properly afterwards. Buy a spare battery and watch 4 movies! That is always my idea! Smart thinking.